Other examples of the scope of our service include our capacity to maintain the air conditioning and heating needs of city services fleet vehicles and relieve the workload of a fleet’s service department by subcontracting the HVAC system repairs, maintenance, and installations. Our dedicated team of highly experienced and well qualified installation specialists utilizes their expertise to guide each customer’s project from concept to completion. 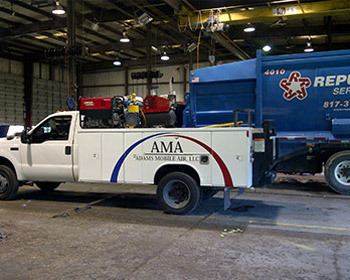 With the launch of the 2015 season, Adams Mobile Air will introduce a new “Client Fleet Management” program to provide an added service to our clients with a large fleet of 50 or more trucks requiring on-going maintenance service. This service is not offered among any other mobile HVAC service competitor in the greater North Texas area. Through the implementation of our “Client Fleet Management” program, Adams Mobile Air will track and record the maintenance of each vehicle within a particular customer’s fleet. This log will allow Adams Mobile Air to break down the service requirements and maintenance records per machine in order to analyze the aging and wearing of replaced or newly installed parts and components. With this program, Adams Mobile Air will be able to pinpoint particularly problematic units which assert the most evident chronic repairs required to retain the proper air functions. This includes measurable performance on a per fleet basis by identifying opportunities for progressive savings through production efficiencies and design. The choice of allowing Adams Mobile Air to maintain the HVAC systems of our fleet clients can be recognized as a benefit to any service program. This plan provides an added value to a fleet manager’s endeavors to remain within their monthly maintenance budget, allowing our customers to key in on the greatest inefficiencies within a fleet. Through this program, customers recognize the value of trending analysis accompanied with documentation contributing to system failures of consistently demanding units’ case history so that each dollar spent with Adams Mobile Air is truly a sound investment. After verified results have been established and confirmed, Adams Mobile Air’s ultimate goal with this service is to keep our fleet customers’ productivity high, downtime to a minimum, and repairs within a manager’s HVAC budget parameters.